Minnesota is full of wild places to explore on foot. From its great system of state parks to regional facilities, if you like to get off road, there are options all around the state. 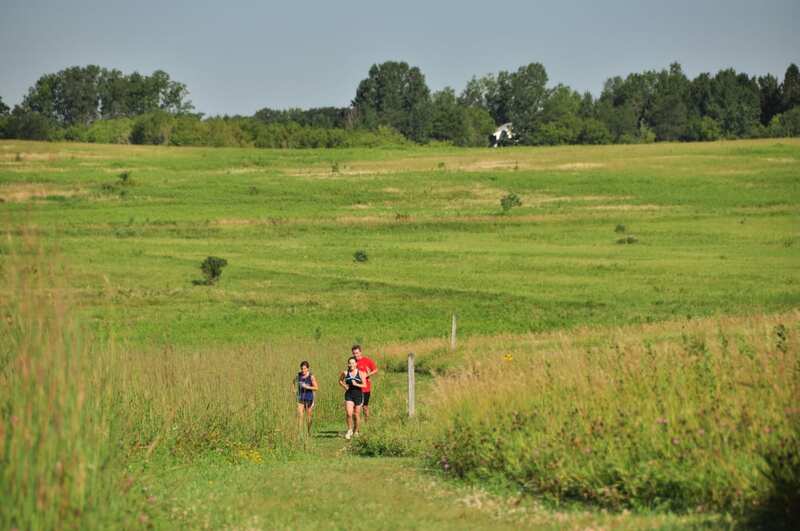 From densely wooded trails or wide open prairies, there’s something for every runner. Indeed, the terrain options range from rocky paths, to soft woodchips and dirt, to crushed limestone. This means that more experienced trail runners looking for technically challenging trails can get their fill, while rookies still have options too. While there are countless trails to explore around the state, we chose a few of our favorites. Next time you’re looking to get into the wild, lace up your running kicks and head to one of these trails. If you’re a Minneapolitan, you can’t beat the convenience of the Theodore Wirth Park trails. Located in north Minneapolis in the shadow of downtown, these mostly dirt and woodchip trails offer many opportunities to mix and match loops. This is also a popular spot for hikers and mountain bikers, so be sure to keep your ears and eyes open while you’re running these trails. Imposing oak forests and fields of wildflowers make this a favorite park for outdoor lovers in the area. With 20 miles of trails to traverse, you can run around Afton all day long if you please. Located in the St. Croix River Valley, you’ll encounter rocky ravines, steep climbs, and plenty of other technical terrain. If you’re interested in signing up for a race in the park, check out the Afton Trail Run , which is known to be one of the most challenging and competitive trail races in the country. The Duluth section of the Superior Hiking Trail is one of the most scenic places to run in the state. The trailhead is located at Jay Cooke State Park and this section of the 296-mile trail spans 41 miles. If you’re interested in exploring the larger section of trail, head to the Martin Road Trailhead north of Duluth. This part of the trail will take you through seven gorgeous state parks all the way to the Canadian border. There are so many great trails to run within the Three Rivers Park District, it’s hard to choose just one. For those in the southern metro, the wooded and grassy trails of Hyland Park Reserve are an area highlight. Murphy-Hanrehan in Savage is the perfect excuse to get out of the inner ring and away from the hustle and bustle of downtown without driving far. Featuring over 50 miles of trails, much of which are off-pavement, Elm Creek is another great option for area trail buffs. With 11 miles of trails around this scenic area, Nerstrand Big Woods is a must-run park. Aptly named, this park showcases the Big Woods, a deciduous forest that has largely been lost to farms and small towns in this part of south-central Minnesota. Running through the park you’ll encounter a hidden waterfall, lush foliage, and blooming wildflowers. If you’d like to make a weekend of it, book one of the park’s easily accessible campsites. Located in southern Minnesota, Chester Woods Park provides a peaceful refuge where you can get away from the city and experience nature. Right within rugged bluff country, the park sits at the headwaters of Bear Creek. Traversing these trails, you may encounter whitetail deer, wild turkeys, and other wildlife. Via several loops that range from 1.2 miles to 2.8 miles, you can tour the native grasslands and shaded paths of this park. The first interstate park in the nation, spanning over the border into Wisconsin, this park was originally designated to preserve the rocky Dalles of the St. Croix River. Not only do the trails of this park feature scenic vistas and peaceful pathways, the unique geology of the park includes lava flows and glacial deposits. If you’re in search of an epic run, connect to the Ice Age Trail on the Wisconsin side and you can run for more than 1,000 miles.